Active at Any Size Day 8: What can I do? You can bicycle indoors on a stationary bike, or outdoors on a road bike. 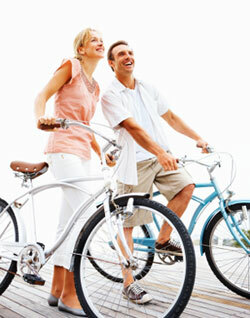 Biking does not stress any one part of the body—your weight is spread among your arms, back, and hips. You may want to use a recumbent bike. On this type of bike, you sit low to the ground with your legs reaching forward to the pedals. This may feel better than sitting upright. The seat on a recumbent bike is also wider than the seat on an upright bike.